Musculoskeletal injuries are one of the main reasons for children and adults to lose their days of school and work. Topical heat and cold application are used to treat musculoskeletal injuries such as bony, ligamentous, muscular and tendinous injuries. Topical heat and cold modalities are used along with physical therapy, chiropractic treatment, exercise and patient education for the multimodal treatment of musculoskeletal conditions. The inflammation that occurs around the tissue injury site stimulates specialized nerve endings called nociceptors. Nociceptors transmit painful nervous stimuli through the spinal cord to the brain. The sensation of pain is perceived. At the same time, neurotransmitters, chemicals produced by our body to signal transmission, initiate a reflexive muscle contraction at the site of injury due to increased muscle activity and tonicity. This will lead to painful muscle spasm if the muscle contraction persists. Persistent muscle spasm causes secondary hypoxic tissue damage due to decreased blood flow and oxygen to the surrounding tissues. 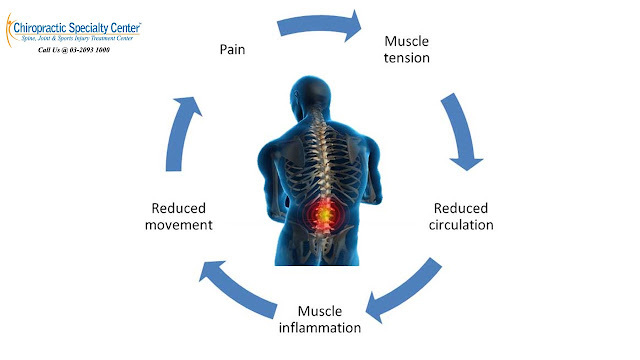 This pain-spasm-pain cycle must be interrupted as early as possible to prevent secondary damage and to manage the pain. Specialized temperature-sensitive nerve endings called thermoreceptors can detect changes in the skin temperature. The nerve signals initiated by these thermoreceptors can block painful nociceptive information within the spinal cord. Proprioceptors that detect joint position sense through tissue pressure changes and movement also reduce the transmission of pain signals to the brain. Activation of thermoreceptors and proprioceptors through physical therapy and chiropractic treatment can decrease muscle tone and relax painful muscle spasm.